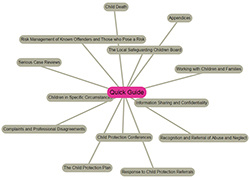 Surrey Safeguarding Children Board Procedures Manual. Please see 'Quick Guide'. You can access this by using the button on the left hand side of the screen. This page is correct as printed on Friday 26th of April 2019 03:06:27 PM please refer back to this website (http://surreyscb.procedures.org.uk) for updates.